Special K Dark Chocolate is one of my guilty pleasures. I feel guilty because it is expensive and contains chocolate. But it’s better than eating a full size Hershey’s Dark Chocolate Bar! I found a way to make that cereal last longer. Instead of eating it with milk, I sprinkle some on top of my yogurt and fruit. When I run out of the cereal, I switch to homemade granola. Special K Dark Chocolate cereal sprinkled over yogurt and fresh fruit. Another way to stretch cereal is to add plain cereal to the expensive box. 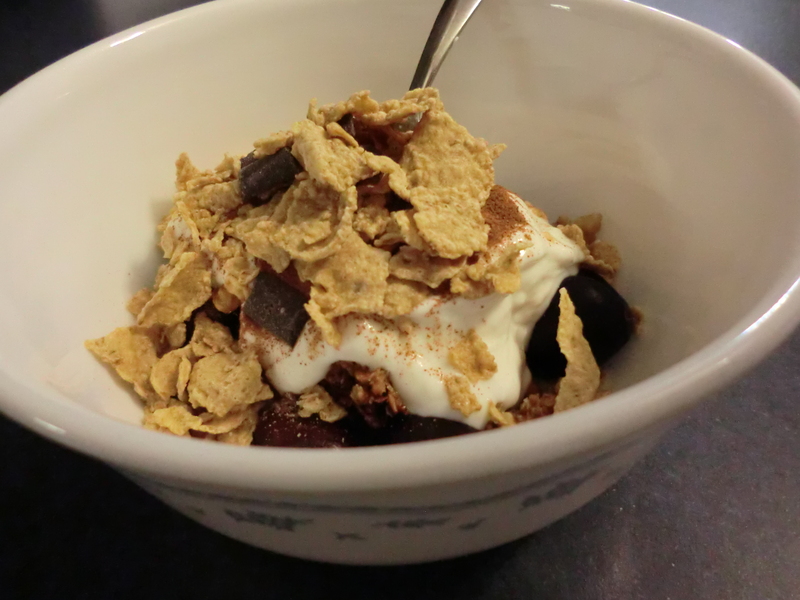 If you love Raisin Bran, you can mix plain bran cereal in with it, or make your own using bran cereal and raisins. You can stretch the fancy Cheerios varieties by adding a few cups of plain Cheerios. Of course, buying the store brand of these cereals saves you even more. I tried making my own Special K Dark Chocolate with cornflakes and chocolate chips. It didn’t work because Special K is made out of rice. Now if I had purchased plain Special K and added dark chocolate chips, I might have been more successful!